Prior to the introduction of number plates there was the Locomotive and Highways Act 1896, which contributed to the rise in popularity for motor vehicles. The Act increased the speed limit and introduced compulsory lights for safety, but more relevantly it required vehicles to be registered by the local council. Even such ideas like driving on the left side of the road was introduced in the Act. At the dawn of the 20th century the number of vehicles on the road reached 5,000. While today this seems a very low figure it was quite scary at the time. The Motor Car Act 1903 was introduced as a result. The Act was intended to help identify vehicles and their drivers, and it did this by mandating the display of registration marks in a prominent position. The first registration marks were made up of one letter and one number. The first, A 1, was issued by London County Council in 1903. This style of a single letter and single digit continued until all possible combinations ran out. At this point the format changed to two letters and up to four numbers. Besides a 1909 Act which introduced road tax to fund road improvements, the Roads Act 1920 was the biggest change in quite some time. This new act changed the registration process so that Councils had to register all vehicles at the time of licensing, assigning a separate number to each vehicle. Different councils were allowed different characters for their licensing. For example, number plates starting KA were exclusive to Liverpool. The problem with this method of registration is that more populous areas ran out of possible marks quicker than other areas. In the case of Liverpool the KA series ran out by 1927, but the SJ series issued by Bute Council lasted until 1963. Areas that did run out of plates though received new formats - three letters and three numbers - and later a reversed format (three numbers and three letters). There was a boom in car ownership throughout the 1950's - in London car ownership quadrupled between 1950 and 1970 - thanks to a rise in the standard of living and reduction in car prices brought about by mass production techniques. There was no way the dateless number plate formats could keep pace with the sheer number of vehicles on the road and something needed to be done. In 1963 a new format was introduced, known as suffix registration marks. These displayed three letters, up to three digits (1 through 999), and then the letter A. This meant any vehicle registered in 1963 would have an A on the end. 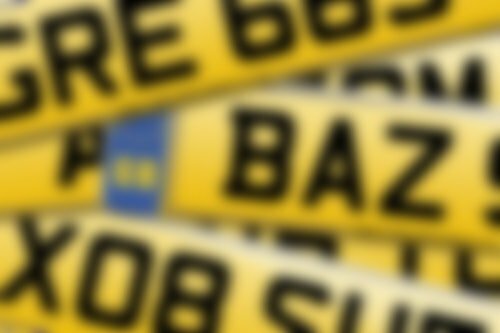 The following year the last letter would change - from A to B to C and so on - so it was possible to tell at a glance the year of first registration for a vehicle. This suffix format would allow for anything up to around 255 million possible combinations of new registration annually, which would be plenty to meet demand. However, although the annual pool of reg was plentiful, when the alphabet was exhausted for the suffix year lettering (in 1983) the format would have to be reversed, putting the year identifying letter at the front, restarting with an A, and ushering in prefix number plates. When this prefix pattern reached the end of it's life in 2001 a totally new format was introduced. As any plate format relying on letters as a year identifier would have a maximum lifespan of 21 years (26 letters in the alphabet, but the letters I, O, Q, U and Z were never used because they too closely resemble other numbers/letters or have been retained for special use cases), the new format instead introduced numbers as marking the vehicle age. Rather than being an annual release there were now two releases every year. This current style of registration - two letters, a two digit number (the year identifier), and three further letters - still allows for some 7 million possible combinations every 6 months, which should still be more than enough to meet demand (as of 2018 there are now approx. 40 million vehicles on UK roads in total), but has the added bonus of the format being able to run for 50 years before further change is needed. At some point while all this was happening, people realised that some number plates were more desirable than others and tried their hand at selling them. This is how National Numbers started - finding old, rundown vehicles and buying them so you could sell the number plate (the car would just be scrapped). Over the years the practice became more and more popular. Today thousands of people are buying and selling number plates. It is amazing how far the concept has come.